Do you struggle to park your caravan in a tight spot or worry if it’ll make it up the slope onto your drive? In our recent gear guide on caravan motor movers we took a look at the Powrtouch Evolution Auto and we have ONE of these to give away to a lucky reader. It’s an incredible prize worth £1,190! Powrtouch caravan movers are unrivalled as the UK’s No1 manufacturer and supplier of caravan movers. The High Tech Powrtouch Evolution system cannot be beaten; designed to be the lightest, quickest and most powerful caravan moving system available on the market today. 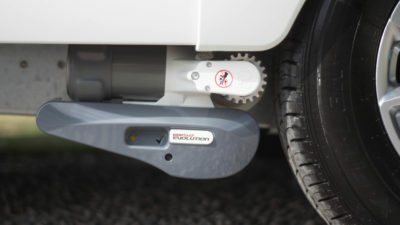 The system will fit all single and twin axle caravans and move your caravan up the steepest slopes and on any terrain. Powrtouch also knows that it can be a hassle hitching up and towing your caravan to a local dealer when an issue arises, so they offer a UK-wide mobile engineer network to visit your home, should the unexpected happen, as well as a five-year no quibble parts and labour guarantee. For a chance to win this next generation Powrtouch Evolution caravan mover, click on the button below. For more information visit the Powrtouch website. Winner to be chosen at random and notified by email or phone. No cash alternatives available. Fitting not included. Fit subject to vehicle eligibility. Winner details only to be passed to Truma, to arrange delivery of the motor mover. Winner details (name and town or county) to be published on our blog and social media sites. Closing date for entries: 11.59pm April 8th, 2019.